The Pit and the Pendulum Animated film on DVD. Edgar Allan Poe's The Pit and the Pendulum animated film now available on DVD while supplies last!. Wallpaper and background images in the Edgar Allan Poe club tagged: poe pit pendulum harryhausen lougee stop motion. 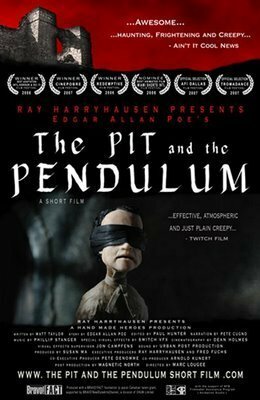 Edgar Allan Poe's The Pit and the Pendulum animated film now available on DVD while supplies last! This Edgar Allan Poe photo might contain anime, truyện tranh, phim hoạt hình, and manga.